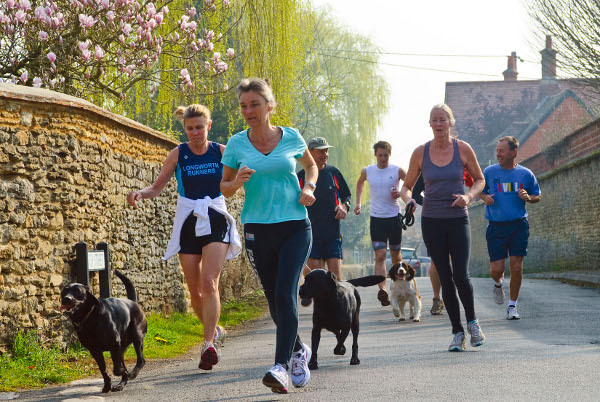 Longworth Runners is a very friendly and informal running club. Locals from Hinton are most welcome, and several of us run regularly with the group. We meet in front of Longworth Village Hall on Saturday mornings at 9:30 am. We usually choose a route of 5-7 miles. We’re a mixed bunch and pace is anywhere between 8:00 and 9:30 minutes per mile. If you’re a straggler and you don’t know the route then don’t worry, someone will run with you! In the summer, we like to run mainly off road. Favourite routes include loops that taken in Ten Foot Bridge, Chimney Meadows, Harrowdown Hill and New Bridge. In the winter when it’s too wet for those routes we stick to the road, sometimes heading for Fyfield or towards Charney Basset. Every year in September we organize a 10k multi-terrain race in aid of HALF. Come and train with us and let us help you prepare for the 10k challenge! © 2019 Hinton Waldrist on the Web.